Fathers are very appreciative towards any gift, generally. If you want a gift that could surprise him, then why not make something special and unique? Something he may not have expected from you. So, think creative and start working for it; fathers love it when their children make efforts. He would absolutely appreciate after seeing some incredible gifts from you. I still remember when I bought a cup for my father on his birthday saying “you’re the best dad ever”, a smile passed down his face with joy. Can you believe Father’s Day is on its way? Well, this is a fun type of work which you would love doing. 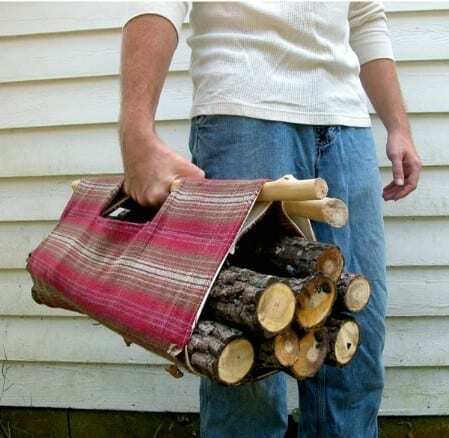 Perfect for any man that involves wood and burning things? I like to make things that last for long and can be kept forever as memories. The natural conclusion here is to burn wood, what you need to do is; Cut your 1×6 woods to an appropriate size for the hands you will trace. 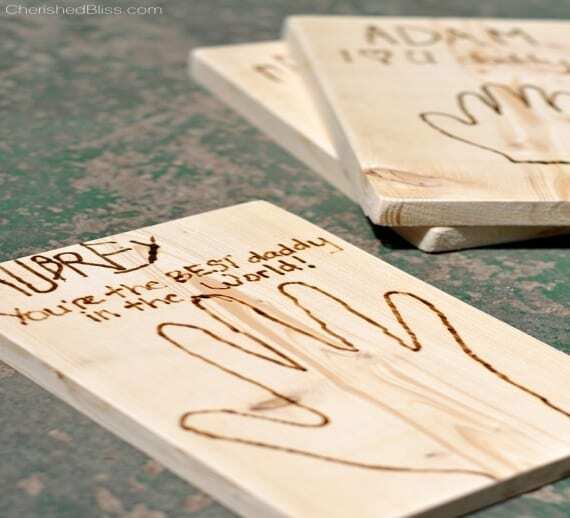 Then sand down any rough surfaces and trace your hand onto the wood. Then write your name and your sibling’s! It’s easy and quick. I admit it. I’m not a good daughter, every year I forget what I’ve got to do on Father’s Day. If you’re in the same boat I'm in, we’re together. So, I decided to make a humble bookmark made from wood which would look elegant and decent. You will need hardwood scraps; the measurement of bookmarks is about 7-in. x 1 3/16- in. Less effort, more appreciation! I really want one of these, always desired for it. Now, that I finally got a chance to make this for my father. Fathers like organizing their things in a presentable way. Surely, he would love this. 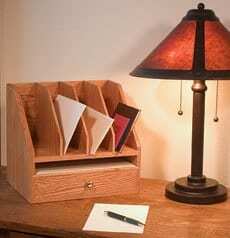 This organizer is made of white oak and features, a series of vertical dividers for piling up your papers, a simple drawer to place any essentials. If you are going to celebrate Father’s Day in a unique way, then why not try it in a less complicated way? Add a photo of you as a child and your father holding you for the first time in his arms. This would remind him of the days when you came into this world, what a wonderful feeling he would go through! Personalize it with a message explaining why he’s an idol for you. Make him feel the happiest!! The time has come again to show your father how much you mean to them. 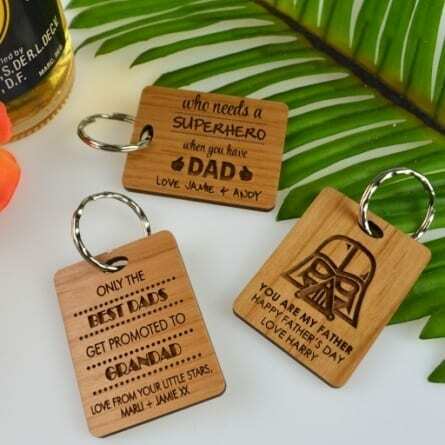 These wooden key rings are truly a loving sentiment for your father. He will proudly display it on his car, garage etc. You will need honey brown wood, and cut it according to the size you prefer. 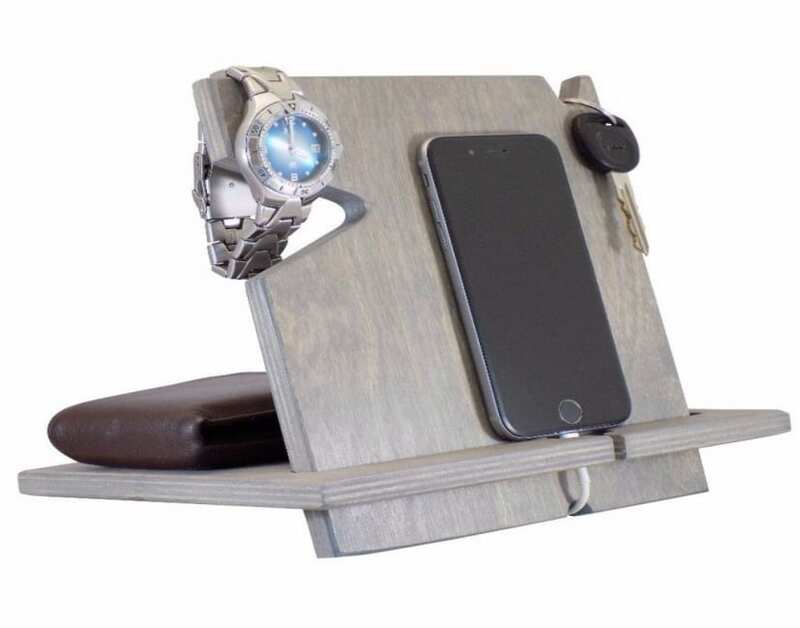 Your father will adore such a gift from you which could make his life easier in many ways! 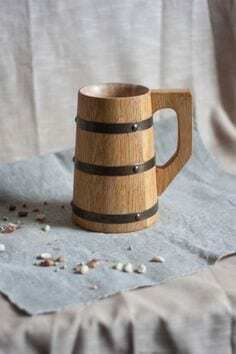 This handcrafted mug is made from real oak wood, circles around are stainless steel. Mug is waterproof and height is 6.5 inches. This mug will be of a great help to my father and surely yours too, a perfect gift that can be utilized in many ways. Pouring water and many more other exciting drinks your father loves! They say that a man’s worth is measured by how he raises his children. Celebrate this year’s Father’s Day with lots of memories of only you and him. 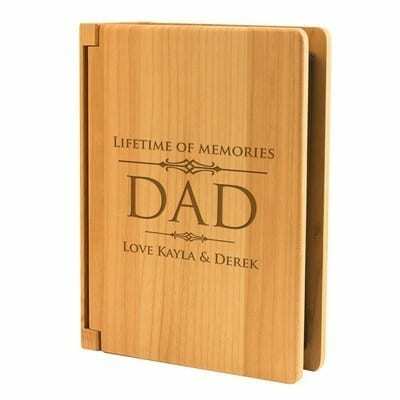 This personalized gift will stay with him forever and he would cherish all the moments he has spent with you so far. It will be a touching gift on the special day. It can hold up to 100 4”x6” photos, so what are you waiting for? Start designing! 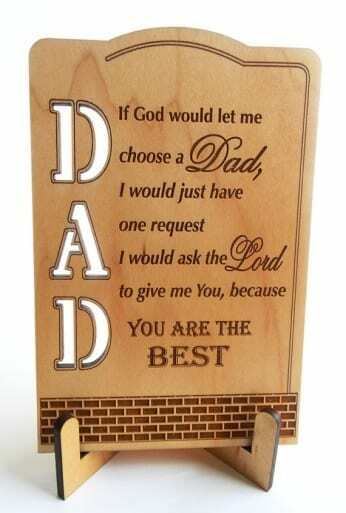 This wooden tabletop plaque is an absolute unique gift a father can receive from you. It will show how much you appreciate him. Fathers deserve something like this, they are hard workers, and we need to reduce their stress. The best part about this product is that no extra cost would be added. 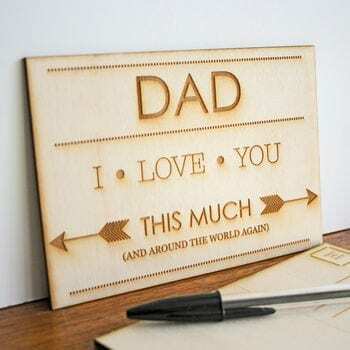 It can be customized by adding your father’s name and a message you want to convey to him, best for decorating in his room. Ever thought of buying an opener for your father? Well, now you will! This is because it is less expensive and affordable for you to buy. 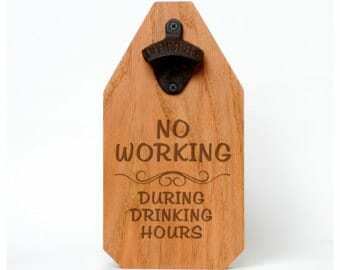 Your father will not face any problem while opening a bottle, easy to carry! Write a message on the front display that you want him to remember even when you’re out of his sight. Go and surprise him! That is a different gift you would provide your father with. I always wanted to gift him something he had never been given before. This seems exactly what I was looking for! The wood card is a specialty and it can be used for various purposes. For instance, putting things on it. Your father can always keep this with him. 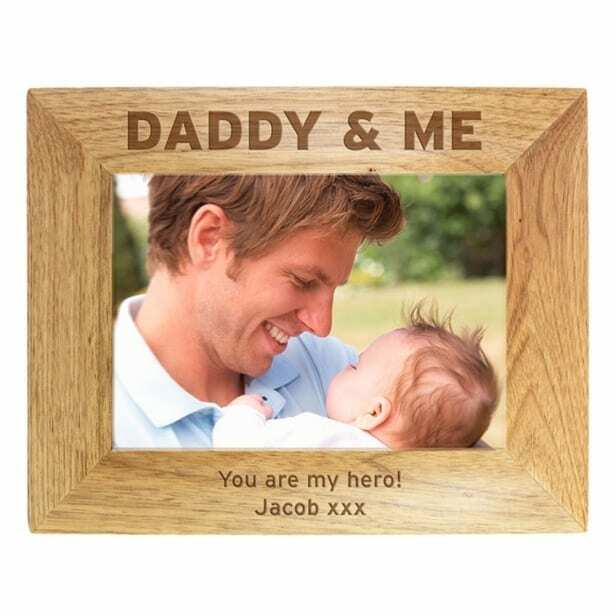 Again, you could attach a picture of you and your father as a reminder of Father’s Day!! What a thoughtful way of expressing what’s in your heart! If your father lives away from you, don’t lose hope of not doing something special for him. Well, your problem has been solved. Make a wooden postcard and write down your feelings, how much you miss him on this day, and ask him to come back. Imagine the expressions he would be dealing with after seeing this for the first time from you! Wow! Your father will absolutely be impressive of such a useful gift. I remember giving something like this to my father, and he still uses it when he goes to the beach. These custom sunglasses will keep his eyes in the shade. Each pair is specially made for ease, images, patterns and design. Your father will enjoy a walk on the beach on a sunny weather! A phone cover is an essential need for all mobile users, we are all aware of the fact that fathers deal with a lot of work via their phones. So, I thought, how about they use it comfortably? 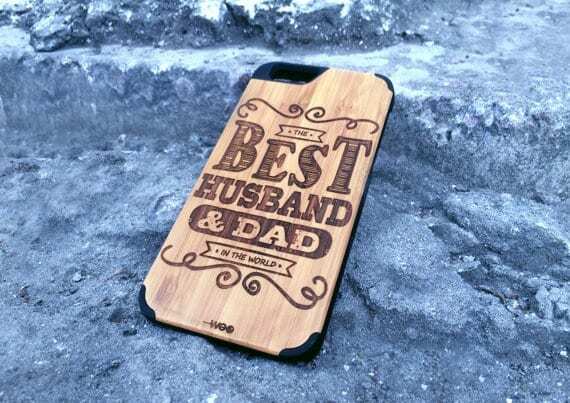 Buy a wooden phone cover for your father that would give them a sense of satisfaction. 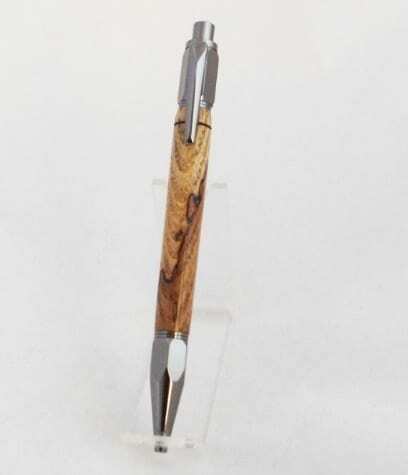 How cool would it look gifting a wooden pen to your father? Something he might not have expected from you at all. Surprise him with this wonder! It will be helpful for him when he takes it to his office. The display already looks beautiful! Go get one before its too late! I’m telling you, he will be amazed. Now this is extraordinary! Your father will not believe a gift like this from you at least. He would adore it as it will be kept with him forever. You wouldn’t see your father happier after seeing this watch. He will assuredly use it for his daily purpose and it would always make him think about you and this day! What are you waiting for?!! 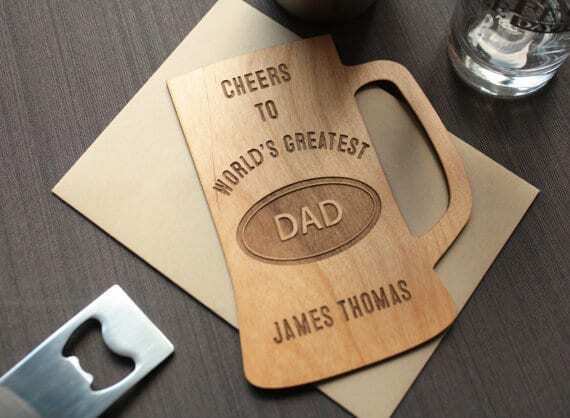 Isn’t this a thoughtful, yet, helpful gift for your father? Yes, of course. 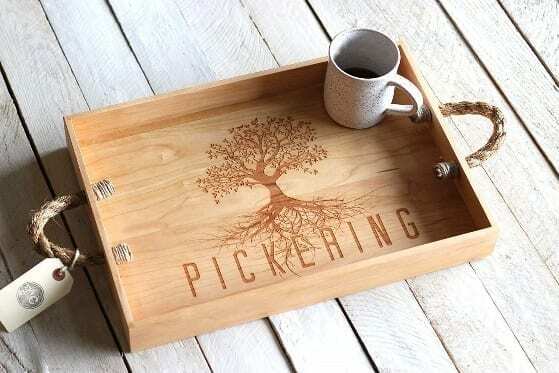 Serve a cup of tea or varieties of food in this personalized wood serving. It would look astonishing and joy of happiness will pass down his face. How heart touching moment that will be! Don’t waste your time and give order, specify! Wouldn’t your father be shocked after seeing such a beneficial gift? He will place his tools after utilizing them; this will ensure they’re kept in a safe place. 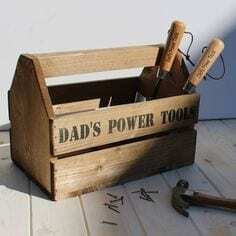 It also looks impressive because of the saying “Dad’s power tool” it will enhance his feelings with delight. How exciting! 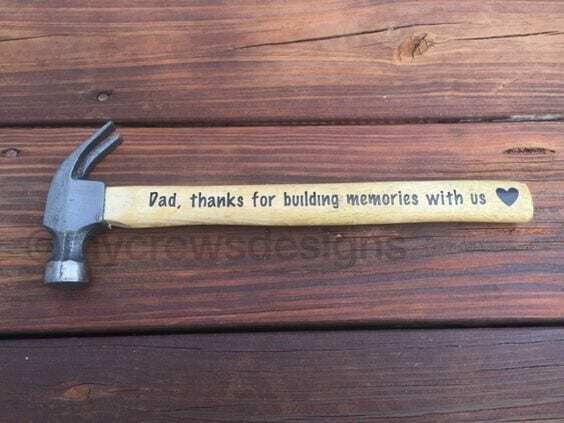 This Father’s Day decorative hammer is made with a wooden designed with professionally cut vinyl. It’s sure to be hit on Father’s Day! He could use it for many purposes such as hammering frames on the walls to beautify! The message will also hold a special place in his heart! If your father is an addictive smoker, then why not give him something valuable? 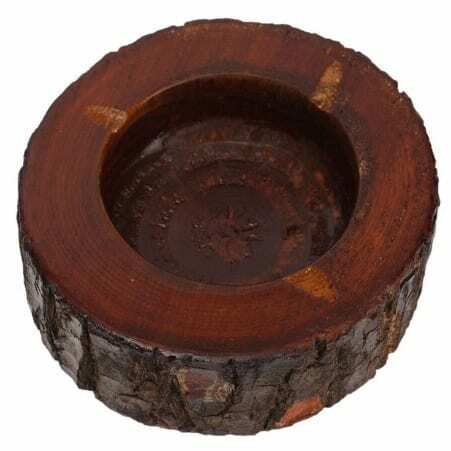 Buy an ashtray that will fill your father’s life with beautiful colors. 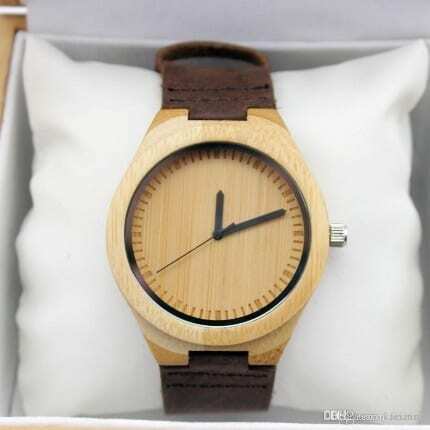 After seeing this gift, your father will be amazed since, it is good looking and attractive! What else would such a father desire for?! In the end, I would like to ask you all if you enjoyed the gifts mentioned above? Did they fill up your queries about what to give and what to not? Well, this was important for me as I would see my father happy and contented after receiving these gifts from me. He would probably not even believe his eyes! What do you think about each of the item? Let us know and do share this article if you liked it. Good luck for preparing! !